Hi there! Today I’m sharing a review for a book that’s languished on my TBR for too long. 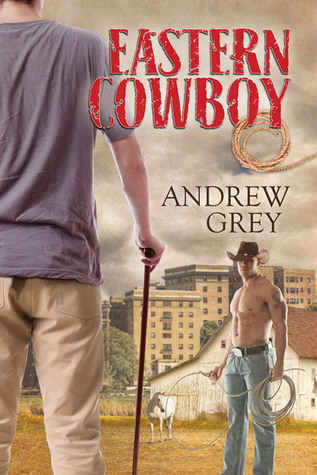 Andrew Grey’s EASTERN COWBOY is a sweet and tender romance that puts two wounded men into an uneasy partnership–and turns into a best case scenario. Brighton McKenzie inherited one of the last pieces of farmland in suburban Baltimore. It has been in his family since Maryland was a colony, though it has lain fallow for years. Selling it for development would be easy, but Brighton wants to honor his grandfather’s wishes and work it again. Unfortunately, an accident left him relying on a cane, so he’ll need help. Tanner Houghton used to work on a ranch in Montana until a vengeful ex got him fired because of his sexuality. He comes to Maryland at the invitation of his cousin and is thrilled to have a chance to get back to the kind of work he loves. Brighton is instantly drawn to the intensely handsome and huge Tanner—he’s everything Brighton likes in a man, though he holds back because Tanner is an employee, and because he can’t understand why a man as virile as Tanner would be interested in him. But that isn’t the worst of their problems. They have to face the machinations of Brighton’s aunt, Tanner’s ex suddenly wanting him back, and the need to find a way to make the farm financially viable before they lose Brighton’s family legacy. I really enjoyed this contemporary M/M romance. Brighton is a recently disabled young man, ashamed of his lame leg and how he struggles with pain and has difficultly walking, standing and even sitting, at times. His last boyfriend was a jerk who left before Brighton even got out of the hospital, and Brighton fought hard to even walk again. When Brighton’s grandfather dies, he’s startled to learn he’s inherited the bulk of his estate, including the historic family farm that’s now boxed in by new housing developments. Brighton’s not able to manage the farm on his own, barely able to walk up the front steps with his cane, but he’s sentimentally drawn to the place. Plus, if he sells it, he’ll be giving up most of the money to his bitter Aunt Vera–the woman who pretty much made his teens miserable by not being loving or caring when she and her brow-beaten husband took Brighton and his sister in after their parents were killed in a car wreck. Determined to see it through, Brighton hires his lawyer’s cousin Tanner, a large, quiet hulk of a man who’d just returned from ranching out in Montana after some personal difficulty. It turns out the Tanner’s just as attracted to Brighton as Brighton is to him. Tanner’s a sweet soul, kind and constant, and I was glad he learned to open up to his own family and Brighton. There are a few steamy scenes between them, and the end is a big ol’ HEA, so that’s fantastic. Interested? You can find EASTERN COWBOY on Goodreads, Dreamspinner Press, Amazon, Barnes & Noble and AllRomance.